All these important networks are connected with the help of conductors and various step up and step down transformers. A typical transmission and distribution scheme is shown in the Fig. 1. A scheme shows a generating station which is located too far away from cities and towns. It is generating an electrical power at 11 Kv. It is required to increase this level for the transmission purpose. Hence a step up transformer is used which steps up the voltage level to 220 Kv. This level may be 132 Kv, 220 Kv or more as per the requirement. Then with the help of transmission lines and the towers, the power is transmitted at very long distances. Design of the transmission lines is based on the factors like transmission voltage level, constants like resistance, reactance of the lines, line performance, interference with the neighbouring circuits etc. Its mechanical features are strength of the supports, sag calculations, tension etc. Transmission of power by the overhead lines is very much cheaper. Similarly the repairs also can be carried out comparatively more easily. The transmission is generally along with additional lines in parallel. These lines are called duplicate lines. Thus two sets of three phase lines work in parallel. This ensures the continuity during maintenance and also can be used to satisfy future demand. 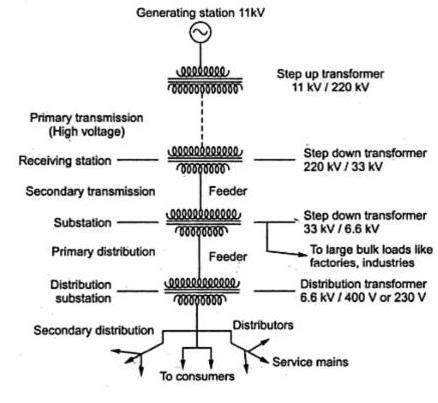 The power is then transmitted to the receiving station via step down transformer. This transformer is 220/33 kv or 220/22 Kv transformer. The power is then transmitted to the substations. A substation consists of a step down transformer of rating 33 KV to 6.6 Kv or 3.3 KV. The transfer of power from receiving station to the substation is with the help of conductors called feeders. This is called secondary transmission. From the substations, power is distributed to the local distribution centers with the help of distributors. Sometimes for bulk loads like factories and industries, the distributors transfer power directly. For the light loads, there are distribution centers consisting of distribution transformers which step down the voltage level to 230 V or 400 V. This is called primary distribution. In the crowded areas like cities, overhead system of bare conductors is not practicable. In such cases insulated conductors are used on the form of underground cables, to give supply to the consumers. These cables are called service mains. This is called secondary distribution. This is the complete flow of an electrical power from the generating station to the consumer permises. Let us study the line diagram of such a typical scheme of transmission and distribution and discuss the various components and voltage levels at the various stages in detail. The Fig. 2 shows the line diagram of a typical transmission and distribution scheme. 1. Primary transmission : It is basically with the help of overhead transmission lines. For the economic aspects, the voltage level is increased to 132 KV, 220 KV or more, with the help of step up transformer. Hence this transmission is also called high voltage transmission. The primary transmission uses 3 phase 3 wire system. 2. Secondary Transmission : The primary transmission line continues via transmission towers till the receiving stations. At the receiving stations, the voltage level is reduced to 22 KV or 33 KV using the step down transformer. There can be more than one receiving stations. Then at reduced voltage level of 22 KV or 33 KV, the power is then transmitted to various substations using overhead 3 phase 3 wire system. This is secondary transmission. The conductors used for the secondary transmission are called feeders. 3. Primary Distribution : At the substation the voltage level is reduced to 6.6 KV, 3.3 KV or 11 KV with the help of step down transformers. It uses three phase three wire underground system. And the power is further transmitted to the local distribution centers. 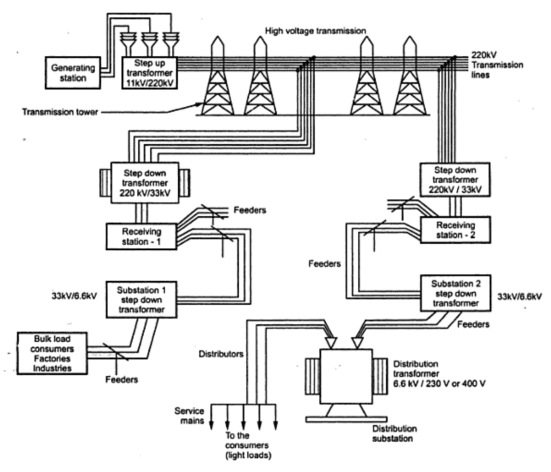 This is primary distribution, also called high voltage distribution. For the large consumers like factories and industries, the power is directly transmitted to such loads from a substation. Such bug loads have their own substations. 4. Secondary Distribution : At the local distribution centers, there are step down distribution transformers. The voltage level of 6.6 KV, 11 KV is further reduced to 400 V using distribution transformers. Sometimes it may be reduced to 230 V. The power is then transmitted using distribution, also called low voltage distribution. This uses 3 phase 4 wire system. The voltage between any two lines is 400 V. while the voltage between any of the three lines and a neutral is 230 V. The single phase lighting loads are supplied using a line and neutral while loads like motors are supplied using three phase lines. 1. Substation : Transmission lines bring the power upto the substations at a voltage level of 22 KV or 33 KV. At the substation the level is reduced to 3.3 KV or 6.6 KV. Then using feeders, The power is given to local distribution centers. 2. Local distribution station : It consists of distribution transformer which steps down the voltage level from 3.3 KV, 6.6 KV to 400 V or 230 V. Then it is distributed further using distributors. This is also called distribution substation. 3. Feeders : These are the conductors which are of large current carrying capacitor. The feeders connect the substation to the are where power is to be finally distributed to the consumers. No tapping are taken from the feeders. The feeder current always remains constant. 4. Distributors : These are the conductors used to transfer power from distribution center to the consumers. From the distributors, the tappings are taken for the supply to the consumers. 5. Service Mains : These are the small cables between the distributors and the actual consumers permises. The interconnection of feeders, distributors and service mains is shown in the Fig. 3. There is no tapping on feeders. PQ, QR, RS and PS are the distributors which are supplied are supplied by the feeder. The service mains are used to supply the consumers from the distributors. Tappings are taken from the distributors. over head transmission lines planning, routing, and design and material supply within a stipulated time schedule is important. VIJAY POWER CONTROL SYSTEMS., as a manufacturer of Distribution, Power, Special Type Transformers upto 10 MVA, 66 KV Voltage Class and Dry Type Transformers upto 3.15 MVA, 33 KV Voltage Class, has been part of Transformer Industry since last 15 years. Increasingly, transmission lines with overhead line materials are routed through areas of poor ground conditions, often for reasons of amenity. This results in the need for the use of special, generally larger, foundations. Transmission and Distribution are the principle part of the power system. Transmission lines are the connecting links between the electrical power generating stations and distribution system. The distribution system connects all the loads to the transmission lines at substations. The substations perform switching functions and voltage transformation.